Many major broadcasters now have resilient fibre links to broadcast teleports at SIS LIVE's headquarters in MediaCityUK and Milton Keynes, along with sporting venues, network operators and studio facilities, plus international teleports and global connectivity providers. UK sports stadia currently benefitting from the rapidly-expanding fibre connectivity network include all the Premier League football grounds, as well as various racecourses and dog race tracks. In anticipation of the Rugby World Cup this year, SIS LIVE has also begun to install resilient fibre links in major rugby venues across the country for ITV Sport. These will include Wembley, Twickenham and Cardiff's Millennium Stadium. The expansion is part of an ambitious strategy to double SIS LIVE's venue capacity for connectivity in the UK by 2016, in order to meet the growing requirements from the sports and entertainments sector. Meanwhile, SIS LIVE's highly-regarded SNG and ad-hoc event coverage continues apace. Since its first live non-sport broadcast of the fall of the Berlin wall back in 1989, it has grown to become a major force in the uplink and SNG markets. Today, it provides contracted digital satellite services to all the major UK broadcasters - BBC, ITV, Channel 4, Five, Sky News and Sky Sports News - and is the only company with multiple regional bases throughout the UK. 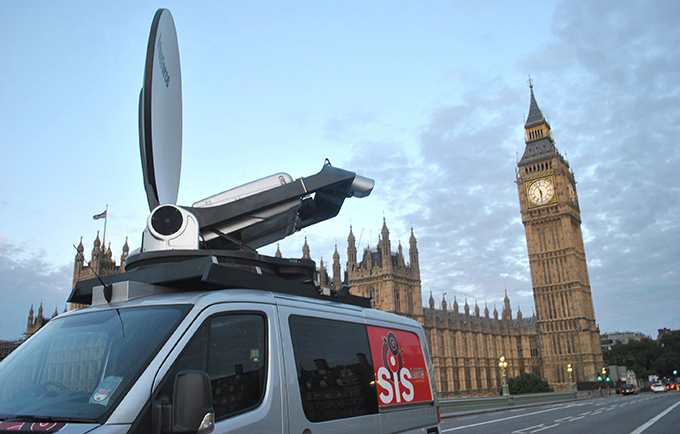 The SIS LIVE fleet boasts around 128 uplink trucks and additional flyaway units, and the company covers over 100,000 hours of satellite links each year for worldwide events. In addition to its contracted services, SIS LIVE uplink trucks have become familiar fixtures at major sporting and entertainment events and TV shows, as part of its highly-valued ad-hoc connectivity service. Credits include the London Marathon; European Tour Golf; Glastonbury Festival; UEFA Champions League Football and Premiership Football. Earlier this year, SIS LIVE was back on the Austrian slopes to reprise its uplink services for celebrity winter sports show, The Jump, on Channel 4. SIS LIVE's dual antenna uplink vehicle and crew were asked back for the second series because a live show from the unpredictable weather conditions of the Austrian Tyrol demands the best and most reliable broadcast partners. Uplink crews from SIS LIVE and its broadcast partners are supported by a dedicated network operations centre, operational 24hrs a day, 365 days a year. 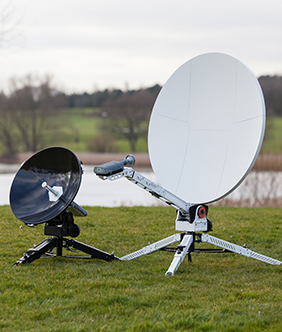 This facility provides monitoring and switching for both satellite and ground based communications and can carry out the most complex routing tasks. 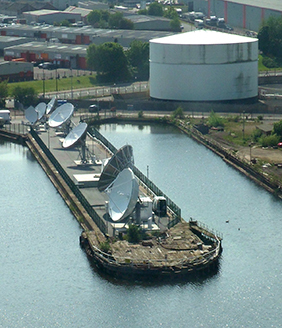 The SIS LIVE teleports at MediaCityUK in Manchester and Milton Keynes are robust, resilient and secure, providing essential connectivity to broadcasters, with direct access to the global satellite market. SIS LIVE is the UK's largest live content distributor. Every day, it supports 125 hours of live transmissions from MediaCityUK and 93 hours of live transmissions from Milton Keynes. Its satellite product range is continuously evolving, as its client-focused project teams innovate and redefine connectivity solutions. Award-winning products are designed and built in-house by client focused project teams who ensure they are of the highest quality, easy to operate, and affordable. Satellite products range from unique, compact 0.6m terminals with no removable parts, to larger 2.4m vehicle mount systems with the best wind load performance on the market. SIS LIVE is making a name for itself in the streaming solutions market, with innovative, cost- effective and reliable end to end services. Live webcasts, social streaming, brand and marketing initiatives can be delivered to multiple platforms, in all formats to all devices. It works closely with global broadcasters and platforms such as YouTube, Google and Skype. SIS LIVE also holds the Guinness World Record for the most concurrent LIVE web streams of an event for Red Bull Revolutions In Sound at the EDF Energy London Eye in November 2013. With a comprehensive fibre and satellite infrastructure already under its belt, SIS LIVE continues to work at improving its cohesive and robust connectivity portfolio, to offer the best, most reliable and cost-effective service.